and navigable passage across the continent of North America." Clark couldn't have been more incorrect but a young Delmar student has found that the Internet has taken her on her own "Oregon Trail" across a continent into the lives of real people at the end of that Trail. I received "Oregon Trail II" for Christmas. During Christmas vacation my daddy and I decided to try our luck in crossing the trail. We worked for three hours. We had to decide what supplies would be needed for the trip. If the wagon was too heavy we had to buy more animals to pull our wagon. We had to decide how we would go across rivers or how we were going to get across a rocky path. It made us feel we were really on a journey. Now I have met real friends on the Internet from Oregon. I have learned more already what life was like on the trail back then. I would really like to visit the end of the trail to see what it really looks like. I would like to learn more about life on the Oregon trail. Ashley saw a poem that a fourth grader in Oregon wrote and decided to send her e-mail. Hello, My name is Ashley. I live in Delmar Maryland. 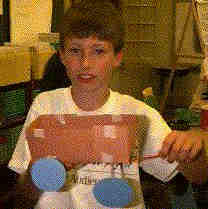 I am from Delmar Elementary. I saw your poem "The Bottle of War." I really like it. I have a CD that goes on the computer that I got for Christmas, it is called Oregon Trail II. You have 1,512 dollars, you have to buy the things you will need on the trail. Like food, extra wagon parts and clothes. It took me 3 and a half hours to go across the trail! The 1st time I played I was bitten by a rattle snake and I died. It's fun. Well I have to go, BYE! P.S. Please write back soon!!! I live in Portland, Oregon. I go to Irvington Elementary School. I am glad you like my poem. It was supposed to be called "The Battle Of War" but my teacher thought the "a" was and "o" and changed it to "The Bottle Of War." I know about the Oregon Trail II game. My friend, Haley, has it. I think it's fun too. The first time we played, we won. Thanks for writing! My name is Tom. I am Christine's teacher in Portland. Did you know that when I drive home at night from school I go right by the official end of the old Oregon Trail? It is a very big deal in Oregon City. I live outside of Oregon City. Every years thousands of tourists come to visit the visitor center at the end of the trail. We just built a new one that is under three HUGE fake covered wagons. They light it up at night, and people can see it from far away. It's cool. In my class we study a lot about the trail during the year, read books about the people who travelled the trail, and make models of covered wagons. If you want to read a very good book about life on the Oregon Trail, see if you can find a copy of THE STOUT-HEARTED SEVEN. I read it to my class as a read-aloud book almost every year. Life was very different back then. Did you know that paper was so scarce back in those days of the 1840's that when people wrote a letter they would write very small, using the paper in the regular way that we are used to, then they would turn the paper sideways and write right over the top of the first part that they had written. Try it. It's called "cross-writing." I much prefer my keyboard! How was Dave from Antarctica? I read a lot of his and your letters. What a great project for you guys. Hello, it is Ashley. Would you send us some pictures of around the trail, or in the museum. I would really like to learn more about the trail. Mr. Dave Hess came to visit us yesterday. He brought alot of maps and postcards and things for us to look at. There is a place called Scott's Hut. It was for expeditions that a group of explorers from England did. They came by boat to find the south pole, so they built a hut. The hut was built to store food in and to come back to at night, to sleep. Now getting back to the trail................. How far can you see down the trail? Do they have any artifacts that they found on the trail in the musuem? I'd love to have some pictures to look at, to get an idea. Well I have to go. BYE!!!! P.S. Please write back soon. and send some pictures! ...It will be fun for me to grab a few shots of the big wagons (at the brand-new interpretive center) that I was telling Ashley about. I'll stop by on my way home from work tomorrow and pick up some brochures and things to send her next week. 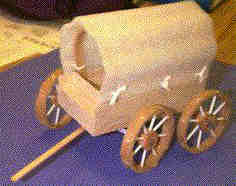 I have a couple of JPEGs to send Ashley tonight of one of my other students with the beautiful covered wagon he built. Did you know that the Connestoga Wagon was a very cool piece of technology and responsible for making a great deal of westward expansion possible? Would be a good research idea for one of you kids. Another good, though very sad, topic for discussion is the effect of disease on Native Americans...diseases brought by the Americans on the Oregon Trail. This played a very important roll in an event called the Whitman Massacre. What a nice surprise to see your letter in my E-mail! Sure, I would be glad to send you some pictures of the "End of the Oregon Trail." I'll try to stop by on my way home from work tomorrow and take some, then send them to you this weekend. Maybe I can get some other material to send you next week by "snail mail." Your visit with Dave Hess sounded very exciting. I can't wait to read about it in your "Global Classroom" pages. I have heard about Scott's Hut. Did Mr. Hess tell you the story about how Commander Scott was in a race to get to the South Pole? He worked very, very hard to get there. He kept a journal so we know exactly what happened. Then he and his five men froze to death on the way back to their base camp at Scott's Hut. It is a very sad story. Movies have been made about Scott and his men. Books have been written about their story. Songs have even been written about them! I'll bet Mr. Hess knows all about Commander Scott and the guy who beat him to the Pole. Getting back to your questions about the Oregon Trail. There are lots of places over the mountains in Eastern Oregon, where the climate is dryer, where you can still walk in the actually wagon ruts of the Oregon Trail. These ruts were made in the 1840's, over 150 years ago. Here at the end of The Trail, our climate is wetter, so all the ruts have washed away. The actual trail is covered up with roads, but the big field where the emmigrants (yes, I spelled it right) actually stopped is still a big field. It is called Abernathy Green, and that's where our new visitor center is located. The visitor center has a few artifacts. Other Oregon museums have a lot more. I'll send you some more material and photos soon. Keep studying history. It is full of incredible stories. Hello from Washington, D. C. I'm Tom Miles brother-in-law and I saw your pages on the Web. I'm originally from Oregon--Portland. I now live in the Capitol Hill section of Washington, D.C. I enjoyed reading your correspondence with Christine and Tom Miles. You have a very nice page on the Web--as does your classroom's page. I've played the game "Oregon Trail" also. Last year I volunteered at our local grade school (Maury Elementary) to help them in their Macintosh Lab. One day I put "Oregon Trail" in the CD-ROM player. It's really a neat game and learning tool. Being a guy I liked the hunting part. I'm encluding one of my favorite poems--that's a little bit about the Oregon Trail in it. It's by William Stafford. Last year we did some research on the Oregon Trail for a CD-ROM project. I have a couple of pictures from the Library of Congress of Lewis and Clark. I'll send them to you as GIF or JPEG files. Maybe you can use them in your class. Your job is to find what the world is trying to be. An Interested Reader Writes from Pennsylvania, gives us a list of good books about the Oregon Trail and sends us pictures of the Trail from Nebraska.